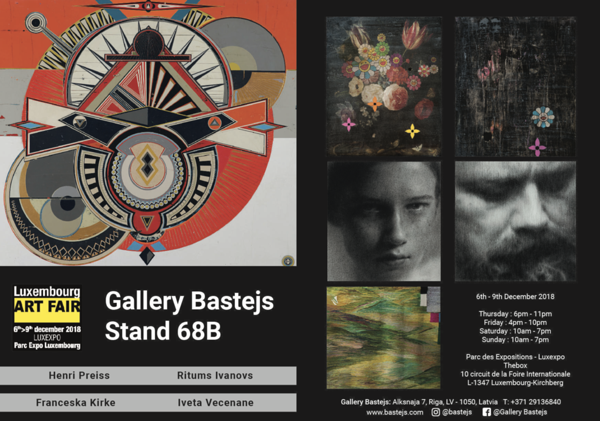 In cooperation with Bastejs Gallery, Ritums Ivanovs works are displayed at Luxembourg Art Fair, the third edition of the international contemporary art fair taking place at the Luxembourg Parc des Expositions. The art fair will showcase around 80 international galleries, selected by its international committee. This is a young contemporary art fair with a selection of cutting-edge international galleries set in the most dynamic economic and cultural region in Europe. The official fair preview will take place on December 5th from 7pm and the fair is open for viewing December 6--9, 2018. The fair is taking place simultaneously with the Luxembourg Art Week, an event that is set in the heart of one of the most dynamic economic and cultural regions worldwide. Through a selection of cutting-edge galleries from around the continent, it lets buyers and collectors sample the best of today's art. A short walk from Luxembourg’s UNESCO heritage-listed city centre, it attracts a rapidly growing number of regional and international visitors.